So here I am, sitting in a Starbucks in Breckenridge, CO finally getting around to this blog thing. It seems like you gotta do it if you're an aspiring mountain bike racer these days. This'll be the place for my race reports, adventures, etc. Check in, I'll be posting as often as I can from the road. Pictures always seem to be what people are looking for, so I'll throw a few in here. 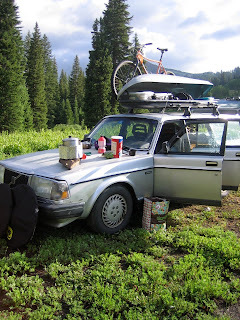 I've been driving around in this old Volvo. It's pretty much awesome, trying to connect all the big races of the summer. Vermont to the CTS International Classic to the Breckenridge 100 to the ORAMM to the Wilderness 101. Okay, the big races if your an endurance junkie. Nationals missed out, but I haven't heard the best things about the course anyway. Plus, I had an awesome week of riding in Crested Butte as a bonus. Yeah, snow biking is amazing, even better when it's July 5th and it's warm outside. Gotta love Colorado. Thanks for visiting. Race reports coming soon.